My VaxHub is disconnected. My VaxHub won't work. Cannot connect to Wifi error. You will receive an error message at the top of the What's in the Fridge Report anytime the VaxHub cannot establish an internet connection. Generally this message says either "Hub cannot connect to Wifi" or, simply, "Hub cannot connect to internet." It is important to note that, so long as the internet connection remains broken, no patient information will transfer to or from the VaxHub. Note: Our VaxHubs do not support connecting to a 5.0GHz wireless frequency. They can only connect to a 2.4GHz frequency. If you have a 5GHz network, it will not appear in the list of available Wifi networks. Safe Mode. Ensure the Hub is not in Safe Mode. If it is, there will be a large “Safe Mode” icon on the left side of the screen. If the Hub is in Safe Mode, simply reboot (see below), but be sure not to touch the volume button while it is rebooting. Refresh the VaxHub app. Select the icon directly to the right of the Home icon, which looks like a square. This will show all apps that are currently running, much like selecting Ctrl + Alt + Delete on a computer. 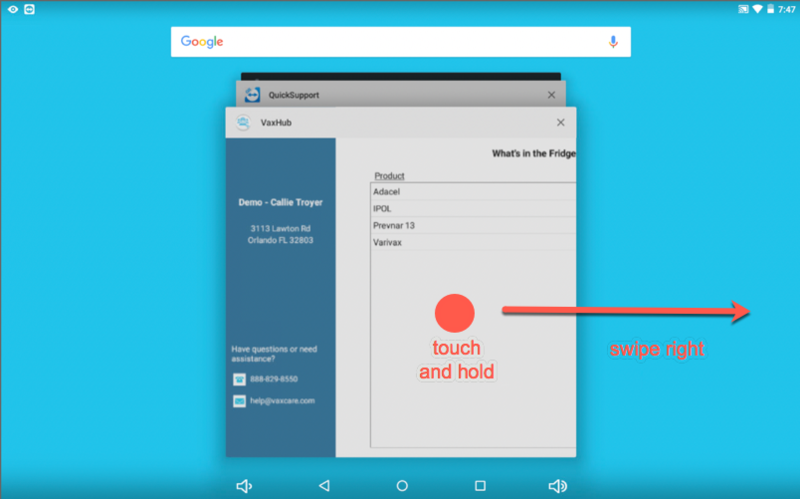 Touch and hold the VaxHub app window as you swipe it right towards the edge of the screen. When the VaxHub window disappears, exit by selecting the Home icon (center button at the bottom of the Hub). Then return to the VaxHub app. Click on the Home icon to return to all of your apps. Click on your preferred network name. (If the Hub gives you the option, select “forget” and then reselect the network name again.) Once again, our VaxHubs do not support connecting to a 5.0GHz wireless frequency. They can only connect to a 2.4GHz frequency. If you have a 5GHz network, it will not appear in the list of available Wifi networks. Type in your Wifi password and select Connect. The status under the network name should show "Connected" within a few seconds. Success! If it shows "Authentication Problem," you have entered an incorrect password. Please attempt to call your IT department to obtain the correct password before calling Customer Care, as we do not keep records of your Wifi password(s). If it shows “Saved” or “Saved, secured," a connection unfortunately did not occur. Sometimes the fix is as simple as reselecting the network name and clicking on the “Connect” option a second time. If that doesn't work, attempt to reboot the Hub and give the Hub a few minutes to attempt to connect on its own. If that doesn't work, you may need to select the network name and tap on the “Forget” option. This means you will need to enter the network’s password again, so make sure it is available to you. If the Hub continues to say, "Saved" or "Saved, Secured," verify with your IT department that the internet is live. And if all else fails, give us a call! Move the VaxHub. Sometimes the VaxHub can establish a connection but the connection remains spotty at best. If this happens, attempt to move the VaxHub closer to the router and/or eliminate barriers between the Hub and the router, such as cement block walls, by moving the VaxHub. If the problem persists, please call Customer Care. Still have questions? Reach out to our Customer Care team. We're happy to help! Message us directly by clicking on the blue Intercom bubble in the bottom right corner of your screen. Email us at help@vaxcare.com. Or call us at 1-888-829-8550.